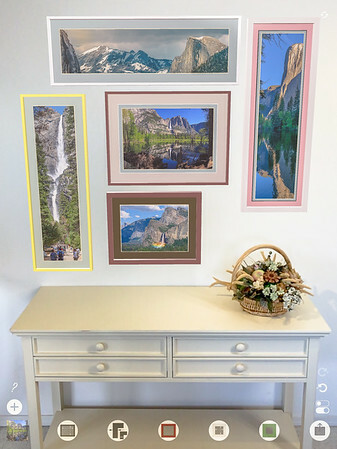 Using augmented reality, Frame It On The Wall allows you to design framed pictures, hang the framed pictures on one or more virtual walls in a scene and create additional scenes in one or more galleries all done in the environment where the pictures are to be displayed. Framed pictures, walls and scenes can be copied between galleries and scenes allowing rapid creation of alternant designs and reuse of previous ones. Because your design is done on vitrual walls, scenes can be quickly reused other locations and are not limited to the original location. It's almost like magic, the way augmented reality integrates computer imagery with the camera's view of the scene in realtime so that imagery and scene move together as one. Of course it's not magic, but it's still amazing. Your device is analyzing the video stream coming from the camera and discovering the 3D structure in that video stream. Simultaneously, it's also creating the 3D graphics imagery and merging that virtual world into the real world video stream. Your device can do almost all of this on its own, except it needs your help to tie the virtual 3D graphics world to the camera video stream world. In Frame It On My Wall, you provide that help when you locate the floor and a place where the floor joins a wall. When you start the app for the first time, it will ask for permission to use the camera which is required for augmented reality. It will also ask to use location services. When you build a gallery in augmented reality, you do so faceing in a particular direction. For example, if you are designing a gallery on the north wall, you are facing north. When the gallery scene is saved, its position is saved relative to the camera. 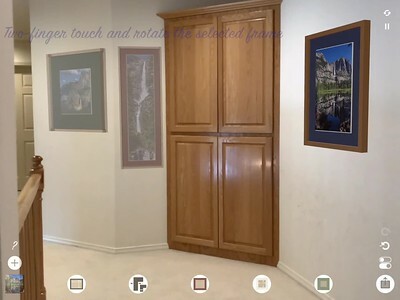 With location services enabled, the orientation relative to the camera is saved so that if you return to the same position but open the gallery scene while the camera points south, the north gallery wall will be behind the camera. When you start the app the first time, it must find a horizontal reference plane, probably the floor because all walls rest on this surface and because pictures are hung on a wall at a specific heights above this reference. Table tops, counters and shelves are alternative horizontal references. Frame It On The Wall will report the position of framed pictures above chosen horizontal surface. You will go through this same locate floor-wall join process when you create new galleries and scenes or when you restart the app with location services turned off. To find the floor, hold your iPhone or iPad angled towards the floor one to two feet above it and shift it left and right as you also move it steadily toward the wall. Moving horizontally left and right gives the device the left and right views it uses to gauge distances. Jerky or fast motion creates blurred images that generate poor distance estimate. You move the device left and right by horizontally rocking your body to the left and then to the right or by smoothly translating the device to the left and right with your arms. Twisting your body left and right rotates the camera which is not as effective at providing the parallax needed for distance measurement. Horizontal rocking works best, because your head and device move together so it is easier to view the screen. A gray rectangle should appear. If location services are on, a compass will appear on the gray rectangle. The arrow points to true north. Augmented reality thrives on light. It definitely works best in a brightly lit area. 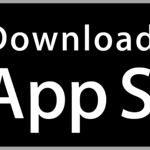 If a gray rectangle doesn't appear within 10 seconds or the compass is not pointing to true north, tap the circular "restart augmented reality" button in the upper right hand corner. A yellow rectangular sight appears in the center of the display device once the floor is recognized. Move the camera so that the sight is over a gray rectangle on the floor and the yellow sight flashes green to show that it is ready. Next, point the camera so the sight center is at the floor and wall join and tap once. In a new scene, a green mesh appears that shows the virtual wall. When continuing work, the most recently used scene reappers. Drag and rotate the scene until bottom edge of a green screen or wall lies along the floor and wall join. You drag or rotate an entire scene by touches that are outside any wall. The distance reported in the bottom center of a wall is the distance in feet from the camera to the bottom center of the wall. If the distance is wrong, tap the circular reset button in the upper right and reaquire the 3D information. “A towel is about the most massively useful thing an interstellar hitchhiker can have," says the Hitchhiker's Guide to the Galaxy. It can be equally useful for augmented reality adventurers. Floors are often very smooth and dark. Augmented reality uses parallax to find distances and smooth, dark surfaces provide neither the structure nor the light for it to work well. A textured white terry cloth hand towel dropped in front of your feet can dramatically decrease floor discovery time. Surprisingly, at this point you should probably tap the pause button (||) in the upper righthand corner, especially if you are a new user of the app. Pausing takes a 3D snapshot of the current real world view and "freezes" that reality so that the real scene no longer changes as you move your device, but you still have full freedom to manipulate the walls and framed pictures that augment the real scene. With "reality frozen", you no longer have to hold your device up towards the wall. Instead you can sit in a comfortable chair at a desk and design the gallery scene as though you were still at the place where you froze reality. When you are ready to view the scene again, return to the location where the scene was frozen, tap the circular restart button in the upper right hand corner and repeat the steps for placing the wall at the floor and wall join. Incidentally, you've seen this kind of effect in movies and TV shows where time is stopped while the protagonist moves through the scene. Each gallery scene in Frame It On My Wall hangs framed pictures on one or more virtual walls. This means that each gallery scene can be reused in different locations with minimal effort. 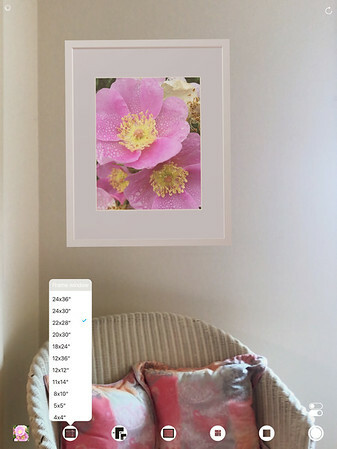 Layouts from one gallery or gallery scene can be easily copied into a new gallery scene where only the walls may need to be moved to match the new scene. When the wall appears, G≣, S≣ and W≣ buttons appear in the lower left corner to show that you are in the managing galleries mode. When these buttons appear, you can manage galleries (G≣), scenes (S≣) and walls (W≣). In this mode, you can also move or alter walls, but you cannot move or alter frames. Touch one of these buttons and a menu pops up with action items. W≣ menu actions apply to selected walls. When managing galleries, any wall that is not colored (i.e. its color is "none") is shown as a wire mesh. If the mesh is green, the wall is selected. If the mesh is red, the wall is not selected. You select a wall with a one-finger tap. The selected wall does not change, but all other walls are deselected and they change to display a red wire mesh. You add a wall to a selection with a two-finger tap. Tap the background to select all walls. A one-finger drag moves selected walls. A two-finger rotate gesture rotates selected walls around the center of the selected walls. When all walls in the scene are selected, the two-finger rotate gesture rotates the scene about a center marked with an orange sphere. You can control where the orange sphere is located with a three-finger gesture. A three-finger long-touch moves the orange sphere to the center of the selected walls. If you wish to rotate around a single wall, tap that wall to select it, then rest three-fingers on the display until the orange sphere jumps to the bottom center of the selected wall. Depending on the direction of the pinch, a two-finger pinch changes either the width or height of selected walls. You can also change the width with the Width item on the W≣ menu. Double-tap the display to switch from managing galleries (G≣, S≣ and W≣) to manipulating frames mode. A row of buttons appears along the bottom for choosing pictures, frame size, frame face, frame color, mat window size, mat color and sharing. Buttons act on selected frames. One-finger tap a frame to select it. Two-finger tap a frame to extend the selection. To position a frame, simply drag it. As you drag, the wall switches to a wire mesh to help you position the frame relative to other frames. You can reposition the entire scene by dragging on the background. This is convenient when you need to examine a detail up close. Simply pull the scene toward you, examine the detail, then push it back into place. Since the scene moves as a whole, you don't have to worry about accidentally repositioning some of the walls as you would when managing galleries. Just as you can drag the whole scene, you can rotate it with a two-finger rotate gesture on the background. The rotation is around the center defined by the orange sphere as it appears when managing galleries. You add a new frame to a wall with the (+) button. When more than one wall is present, you are asked to pick a wall for the new frame. A double-tap switches between managing galleries and manipulating frames modes. Double-tap also dismisses color pickers. With the bottom button row displayed, tap on a frame and you select it and all the other frames are dimmed. Tap outside any frame and you select all frames. Selection matters because buttons, rotation and dragging affect selected frames. When you want to select a single framed picture, tap with one finger. When you want to select more than one, tap additional frames with two fingers at the same time. A two-finger tap is different from tapping twice with one finger. Flip between horizontal and vertical frame orientations with the two-finger rotate gesture. For example, place your thumb and fore finger on a framed picture and move them in a clockwise or anti-clockwise rotation. All selected frames flip and mat window sizes change once the gesture ends and the rotation is greater than 30 degrees. Don't panic. Frame It On My Wall has a many level deep undo capability. If you suddenly realize that you had all the frames selected when you picked a new picture or changed a frame color, don't panic. Simply undo the goof. The undo button is the counter-clockwise pointing arrow on the right side of the screen. The redo button is the clockwise pointing arrow above the undo button. Undo is backwards in time, redo is forward in time. When menus contain too many items to fit on a screen, the menu list can be scrolled to see the rest of the items. Tapping the question mark in Frame It On My Wall brings you to this page of helpful tips by opening your web browser. Help is accessed at tips.FrameItOnMyWall.com. The plus button (+) adds a copy of a selected frame to the wall. Created too many frames? To delete selected frames, tap the meshing gears icon in the lower right corner of the screen. A menu pops up containing a Delete item. Tap Delete and the framed pictures will be removed. Delete is undoable, of course. Managing galleries mode menus allow you to clear walls and scenes at once. Once you have a framed arrangement you like, press the share sheet button in the lower right hand corner. Your screen will flash as it captures your scene. Choose where you want to save your scene. Sharing to the Notes or Mail apps adds a report to the capture image. After you've saved a scence, try some variations by changing the current scene or by creating new scenes. Later on, refer to your reports saved to Notes when you work with clients or shop for frames and mats in a store or online. An archive is a Frame It On My Wall data package that can be saved to the Files app or shared to Notes, Mail and Messages. To create a backup, tap the Archive menu item on the Gallery or Scene menu. Restore any archive later on from the Restore archive item on the Gallery menu. Each archive includes copies of any framed photos in that Gallery or Scene. Once a project is complete, archive its gallery or scene and then delete that gallery or scene to keep only active projects in the app. Besides backups, you use archives to share a scene or gallery with other app users or with support. You also use archives to transfer scenes and galleries to your other iPhones and iPads with the Files app via iCloud." From the Gallery menu, choose New Gallery and name it Templates. 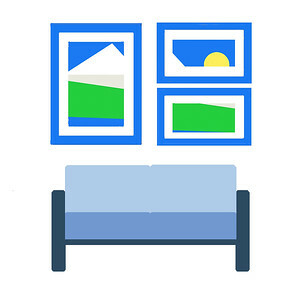 Switch to a different gallery and layout frames in a design. Copy that design to a scene in the Templates gallery. If you have photos in the design, switch to the copied scene in the Templates gallery, while all frames are selected and tap the (...) button and then tap Remove photo. Afterwards, the scene contains frames without pictures. Later you quick start a new project by copying a template to the project gallery. To work with Lightroom mobile, simply open the photos you are interested in using and tap the share icon to save the photos to the camera roll. Then in Frame It On My Wall add the photos from the camera roll to its frame. After you have finished the framing project, you may delete the photos from the camera roll. 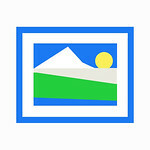 Frame It On My Wall maintains a local copy of the image on your device as long as the image is used any picture frame. You don't need a real wall to hang pictures. 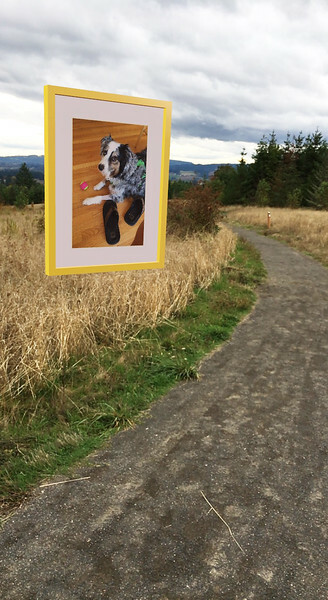 Pictures will hang wherever you place the virtual walls, even outdoors. Understanding window sizes is important because frames and mats are sold in stores by window size. You will think of the window as the opening in the frame or mat and you may be surprised to learn that this opening is smaller than the window size. Frames are sized by what they hold inside. This size is called the frame window size. Frames hold the materials by overlapping each edge of the material by about 0.25". As a result, the "hole" is smaller than the window size by at least 0.5" in width and height. For example, a 36x24" frame will hold a 36x24" sheet of glass as well as 36x24" mat boards. But the visible portion of any framed art will be only about 35.5x23.5". Frame windows are frequently called openings and their size is called the opening size. Mats are sized by both their outside dimension and the size of the window cut into the mat. The mat's outside dimension tells you what size frame to use with the mat. For example, a 36x24" mat fits a 36x24" frame. So that's easy. Mat windows are sized by the smallest print that the mat can hold in the window. This size is called the mat window size. To hold a print well, a mat needs to overlap the print by about 0.25" on each edge. As a result, the portion of the print that is visible is smaller than the mat window size by about 0.5" in width and height. A mat can hold pictures larger than the mat window size. To create a custom window size, tap the Custom... menu item at the bottom of the frame or mat window size menu. Custom sizes that you create are stored with the frame in the scene. 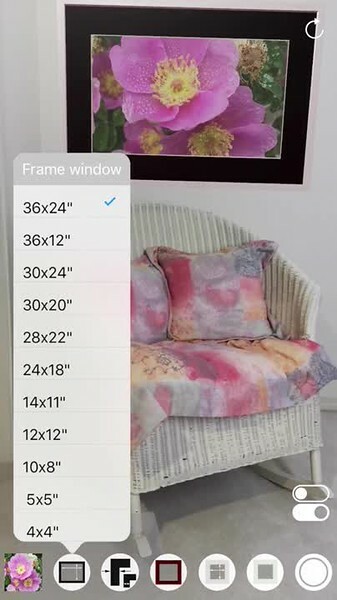 When the app is started all frames are scanned for custom size and if found, the custom size is added to the appropriate frame or mat menu. If you create custom sizes that you do not use in any frame, the sizes will automatically disappear when the app is relaunched after a force quit. Frame custom window sizes can be no larger than 99.9 inches in either dimension. Mat custom window sizes can be no larger than the longest frame window dimension. The frame face width is the width of the material making up the front sides of the frame. The overall or outside size of a framed picture is the frame size with the face widths added and the overlaps subtracted. For example a 36x24" frame with 2" face width has an approximate overall size of 39.5x27.5". Wide face widths tend to work better with larger art and narrow face widths tend to work better with smaller art work. As a starting guide, choose a face width between 1/10 and 1/4 of the length of the shortest side. For example, 18x24" art generally works best with face widths between 2" and 4 1/2". On the other hand, a starting face width for an 8x10" image would be 3/4" to 1 1/4". If a face width is too wide, the frame will dominate the art and draw to much attention. If it is too narrow, the art will appear to be too large and the result will appear unbalanced. With version 3.2, you can also set custom face widths. The Custom... menu item is found at the bottom of the Face width menu. Mats with windows that have top, bottom and sides all the same size are called even border mats.Mats with top and bottom borders the same size but the side borders a different size are called balanced border mats.Mats with side borders the same size, but the top and bottom borders are different sizes are called weighted border mats. Many mat window sizes available in the app are not stocked in stores. This is especially true for colors other than white or black. Fortunately, mat boards are available without pre-cut windows and framing shops are happy to cut the windows to your size. Mats without windows are called mat blanks. Framing shops can also cut matboards to fit any frame up to about 40x30". Long press on a picture frame pops up a menu with options for overmats, bottom weighting, mat core colors, keeping the photo aspect ratio, bevel color, overmat bevel color, liner size and face profile. This is the same menu that pops up when you tap the (...) button. The number of frame styles is huge. One aspect of frame style is the shape profile of the frame's face. The shape profile is the outline of a frame's cross-section. With version 3.3, Frame It On My Wall supports flat, bevel, curve, round slope, reverse slope, triangle, step and stripe profiles. Frame profiles are chosen from the Frame profile item on the frame pop up menu (see above). The word reverse used with a frame profile means that the outer edge of the frame is narrower than the inner edge. Double matting uses two mats to frame the picture. The top mat or over mat has a larger window than the base or under mat. The portion of the under mat that shows is called the liner. The inner substance that gives matboards their strength and thickness is called its core. Matboards are available with black, white or cream color cores. Cream cores are the most common and inexpensive type. When a window is cut in a matboard it is cut at a 45° angle causing the window to be outlined with the color of the core. The outline is easily seen and it is a distinctive feature of a framed and matted picture. To get rid of frames and mats set the frame face size to 0.00 and the mat material to "none". To mimic a canvas, set the frame face size to 0.03 and the mat material to "none". Double-tap a framed photo to scale it up with a pinch out. Once scaled up, slide the photo inside its mat with a finger drag for a different crop. With the phone pointed down and 1 to 2 feet above the floor in good light, allow a few seconds for the app to anchor its position and the focus square to flash green. Then stand, raise the camera to eye level and position the crosshair at the join between the floor and wall. Standing increases the accuracy of measurements more than 5 feet away. With the crosshair at the floor and wall join, tap the screen. A virtual wall appears. While the virtual wall is dragged, it displays the distance from the camera to itself. When the virtual wall is aligned with the floor and wall join, the distance shown while dragging should match the distance the camera is away from the wall. If you need to be really precise, use a tape measure to check that the reported distance matches the real world distance. If it doesn't, tap the reset button in the upper right corner and reposition the virtual wall. With the crosshair at the floor and wall join, tap the screen. A green screen appears. While the wall is dragged, the green screen displays the distance from the camera to the wall. When the green screen is aligned with the floor and wall join, the distance shown while dragging should match the distance the camera is away from the wall. If you need to be really precise, use a tape measure to check that the reported distance matches the real world distance. If it doesn't, tap the reset button in the upper right corner and reposition the green screen. Distances and sizes measured with augmented reality are amazing close to measured values considering the technology used. However, they are not exact. Good results require 3-9 seconds for the software to acquire anchor points and to identify the location of the floor. The floor must have some texture to it and the room must be well lit. Initially, the camera should be pointed down and close to the floor. Once the floor is detected, gradually tilt the camera towards wall. A report is included when a scene is shared to Mail or Notes. Each report includes the sizes, colors and picture information for all of the frames in that scene as well as a photo of the scene including the frames. Sharing to Notes is a great way to keep track of your design process. When you share to Notes or Mail, you can add extra information. When you are just interested in reading the report, share to Notes, read the report and then cancel the share. 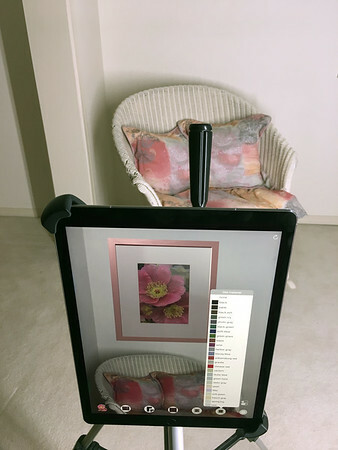 To appear undistorted, a framed picture must (1) be in the center of the screen and (2) be on a virtual wall that is perpendicular to the camera. The iPhone and iPad use a wide angle lens that exaggerates perspective especially near the edges of screen. Any tilt of the iPhone or iPad can have a strong effect on the shape of the frame. All sizes are in Imperial inches and feet. These sizes match sizes commonly used in the US. Metric users may find that many of the sizes are close enough to metric sizes to be useful or that specifying custom sizes in inches converted from metric sizes is a practical work around. The Custom... menu item is found at the bottom of the frame and mat window size menus. An inexpensive tripod can be used well to hold your iPhone or iPad vertical. It may make it easier to explore many more arrangement and framing choices. We use a Grifiti Nootle attached to a cheap tripod to hold the iPad at picture height. Note that augmented reality requires some left<->right motion to maintain its 3D information. If your device is on a tripod, you will need to provide that horizontal motion occassionally. Artists may find that placing their device on an easel works well. Since its introductions in version 2.5, the "freeze reality" pause button (||) allows detailed design work after initial placement without holding the device up. We find that woring in "frozen reality" is often preferrable and less fatiguing than using a tripod. Just below the restart augmented reality button in the upper right corner is a pause button (||). Tap the button and augmented reality is frozen with the last view locked on the screen. Pressing the restart button resets the augmented reality and starts a new session. Pausing reality is used when you have set the scene initially, and need to refine it while working in a different place. While reality is frozen, you can both create new scenes with that frozen reality as a background and switch to other scenes. This makes it easy to explore alternative frame arrangements. When making changes to colors and mat windows on an iPhone, a bigger image is helpful. To zoom in, either walk closer to the pictures or drag the pictures closer to you. If you are considering art that is already in a stock frame, photograph it with your phone. Be careful to line up in front of the art so that the frame is not distorted. Then crop the photo so it just fits the frame. Finally, in the app choose a frame width of 0.0 and a mat size of 'none'. Choosing the right mat enhances a picture. Common choices are really light or very dark colors. Nearly black mats make vibrant photos pop. Light mats that match the wall color tend to make a picture float. If you use a light mat, it should be a tone darker than the lightest area in the picture so that the picture's light areas appear even lighter. The gives the picture more apparent brightness depth or "pop". If you use a dark mat, it should be a tone lighter than the darkest area of the picture so that the picture's dark areas appear even darker giving the picture more "pop". Mat and overmat material menus highlight in green mat material items that are closest to the average of the 20% darkest colors, the average of the 60% middle colors and the average of the 20% lightest colors. You should regard the highligted colors as useful suggestions for mat colors. The mat color that works best for your image and frame combination is likely to be similar to the menu items that are highlighted in green. The colors in menu items are those that are close matches to frame and mat colors that are available in stores. If you wish to explore other color possibilities, choose the item Custom colors... to popup a hue, saturation and brightness color picker containing thousands of colors. 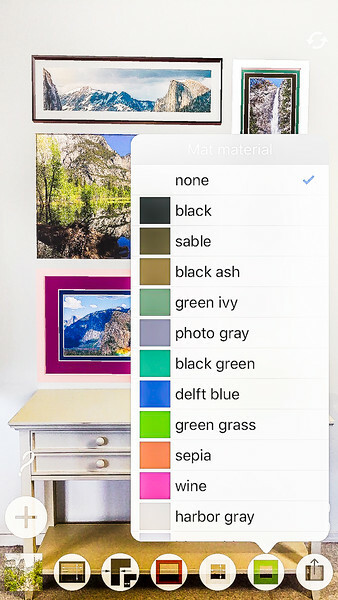 As you slide through the color picker's grid of hue and brightness, or slide its saturation, or tap and drag about the scene, the frame or mat quickly changes to the color under the touch. When the color picker is closed, the last custom color is saved with the frame or object and will appear as an item in the menu in the future. 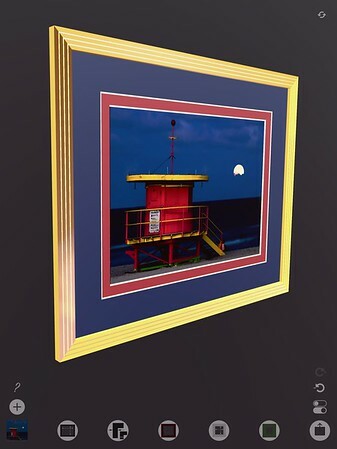 When the app is opened, any custom colors saved in any framed picture in the library of galleries will appear in the appropriate menu. The custom color picker picks up the color on the screen that is under the touch point and applies it to selected walls, frames and mats. The resulting color of the wall, frame and mat will probably appear to be somewhat different from the color touched because walls, frames and mats use different materials that absorb and reflect light differently. In addition, the scene lighting also affects colors. When you touch a color, the picker grabs the color as it appears on the device. The grabbed color includes the original color plus material and lighting influences. This modified color is then applied to selected walls, frames and mats. As a result, if you are choosing colors for a frame by touching the frame, its color will change every time you touch it. You compensate for these changes by tweaking the color picker hue and brightness grid or its saturation slider. When trying to match colors so that all walls, frames or mats have the same color, choose the same color item on the wall, frame or mat color menu. 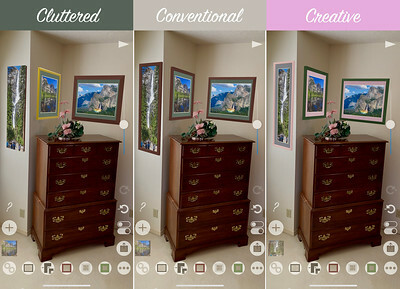 The colors used in the app have been measured from commercially available frames and mats. However, colors you see on the screen will not exactly match the colors you see when you hang your real framed picture. There are many reasons for this. For example, light varies in color throughout the day. Mat and frame colors differ slightly from manufacturing run to manufacturing run. Mats and frames, like all colored objects, fade over time so old stock can be different in color from new stock. Glazing can have slightly different tints or can be slightly diffuse. 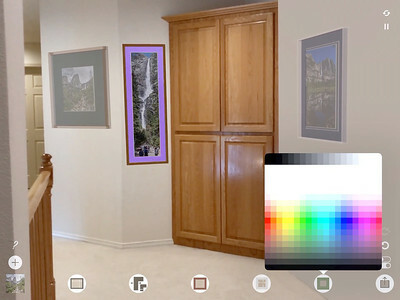 Details of textures and reflections not present in the augmented reality view will affect the appearance of the real framed picture. Frame It On My Wall does not handle bright reflections off any picture glazing. For long life, art as a rule should not be hung opposite bright lights or windows. Color fidelity also depends upon your iPhone or iPad settings. For example, night shift has a huge impact and should be turned off when using the app. True tone may also affect your results and it is worthwhile to try it both on and off. Regardless of these differences, we have discovered beautiful color, size and arrangement combinations that we would not have found without Frame It On My Wall. Mat color choices with gray backgrounds have uneven borders. The widths of the vertical and horizontal mat borders are different. These choices are bottom weighted when the side size is smaller than the evenly distributed top size. When you end Frame It On My Wall, the walls and framed pictures are saved so that they reappear when you quit and then reopen the app. All you have to do is reposition the wall in the new location and all of the pictures appear in the same relative position in the new location. With the flexibility of the virtual walls, photographers and designers can create an arrangement in one location like a studio and then take the arrangement to the customer for on location approval or adjustments. When another app comes to the fore in iOS, Frame It On My Wall is pushed into background mode behind the foremost app. While in background mode, Apple's augment reality does not receive updates on the location and orientation of your device. When you bring Frame It On My Wall to the fore, it attempts to use the last known positions to resume augmented reality tracking. If the device has moved very little during the time the app was in the background, tracking may resume successfully and results can remain accurate. Unfortunately tracking sometimes resumes and sifts the scene so it is no longer aligned with the augmented reality. If that is the case, tap the circular reset augmented reality button in the upper righthand corner. In rare cases, sudden movements or very large changes in device position and orientation require the app to be restarted to reacquire scene and augmented reality tracking sync. Since the app automatically saves its data when it is pushed into background mode, you should lose no data if you have to force quit and then start the app after it is in background mode. With all frames selected, any change affects all. Pick a photo from the library with all frames selected and every frame fills with that photo making it easy to compare the photo in with different mats and orientations. Pick a frame material or mat material with all frames selected and the framing and mat colors are set the same. Undo will come in handy when exploring possibilities. Frame It On The Wall works well with either, but each has its advantages. An iPhone is easier to hold and move around while the iPad provides more detail and with its larger size, a better design and viewing experience. With the introduction of the ability to freeze reality in version 2.5, designing with the iPad Pro 12.9 is a pleasure. Frozen reality is especially helpful when laying out pictures after initial placement of the walls. The app was developed on both an iPhone 6s and an iPad Pro 12.9 (2017). Performance on the iPhone 6s is satisfactory, but the larger screen of an AR capable iPad is very useful. With the files app in iOS 11, you can transfer gallery archives between devices allowing you to continue work on either your iPhone or iPad. Both landscape (horizontal) and portrait (vertical) orientation of your iPhone or iPad are supported but only in the orientation where the camera is at the top. This means that the home button is at the bottom in portrait orientation or at the right in landscape orientation. Augmented reality works better in this app with the camera at the top. When you're ready to frame, don't forget to take both your art work and the examples you chose from your camera roll. You'll want to work with a framer and real frame and mat corners to get the best result. Augmented reality depends upon cameras, display screens, distance sensing technology, color balancing, lighting, 3D modeling and software. As a result, you should expect that what you see framed on the screen is close to, but not exactly the same as what you will see in reality with the final framed picture on your wall. Frame It On My Wall is intended to help you explore and narrow your choices. The the final choice is yours. It should be based on your own examination of the chosen materials in appropriate lighting and confirmed measurements prior to framing and hanging. Frame It On My Wall has an in app settings dialog that allows you to change the way the app behaves. If you find the app is behaving differently than you expect, check the settings to verify that they are set as you expect. Turn off "Use true north orientation"
Frame It On My Wall uses the magnetic compass in your device to orient the AR coordinate system to point toward true north. Unfortunately, some locations keep the compass from finding true north. For example working in a steel frame building can shield the earth's magnetic field. Working very close to a magnet, electric motor or computer can also confuse the compass. Even using a case for your device that contains magnets sometimes causes problems. If you discover that the Frame It On My Wall compass emblem points in the wrong direction or jumps around weirdly, turn off the "Use true north orientation" in the app settings and restart the app. After the restart, the orientation of the coordinate system and the position of gallery walls will depend upon the orientation of your device when the app is started up. This message sometimes appears when location services are enabled to locate true north or when the camera lens is covered. Location services can fail if your device's compass has not been calibrated after an iOS restart. It can also fail if your device is too close to a laptop, iPad or other device with stong magnetic fields especially when starting the app. Your device should be a foot or more away fron magnetic devices. You may need to remove a device case that has magnets. Magnets can really confuse a compass. Option 1: To recover tap the Reset button and move the device around to callibrate the compass. Option 2: To recover from this error, force quit the app and power your device off then on. Option 3: To recover from this error, force quit the app, disable location services for the app, and start the app. With the app running, enable location services for the app then tap the circular restart experience button in the upper right corner. Option 4: Disable location services and use the app without location services. The five framed photos of Yosemite National Park can be found at GeorgePurvisPhotography.com. Frame It On My Wall does not collect personal information or directly access the internet. It does require you to give it permission to access your phone's camera and photo library. The camera is required to implement augmented reality. 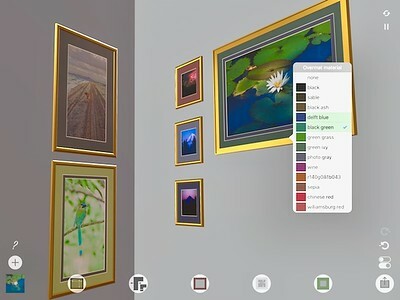 Access to your photo library is required to provide pictures for framing and to save snapshots of the augmented reality scene. All data is stored locally on your device until you choose to share it via the standard share sheet. Among other things, access to the share sheet means that you can store data in iCloud and retrieve data from iCloud via the Files app. Help information is accessed at tips.FrameItOnMyWall.com using your default browser app which is typically Safari. October 31, 2018: Version 3.5.9 adds "Use true north orientation" to the in-app settings dialog. October 26, 2018: Version 3.5.8 fixes an issue where menus displayed incorrectly in landscape orientation on a plus sized iPhone. September 26, 2018: Version 3.5.5 adds a More Actions button (…) at the end of the bottom button row that pops up the same menu as a long press on a framed picture. Exchanges the position of the copy-paste-delete meshing gears button with the pick image button to provide a more logical left to right counterclockwise workflow. Removes an issue where frame width adjustments of fluted frames caused the side lengths to be wrong. September 21, 2018: Version 3.5.4 Adds a More Actions button (…) at the end of the bottom button row that pops up the same menu as a long press on a framed picture. Exchanges the position of the copy-paste-delete meshing gears button with the pick image button to provide a more logical left to right counterclockwise workflow. Removes an issue where frame width adjustments of fluted frames caused the side lengths to be wrong. It also fixes an issue where setting the size of the wall when creating a new wall sometimes failed to apply the meter-To-Feet-Conversion correctly causing walls to be unexpectedly narrow. Walls that cover pictures block selection, dragging and rotation. Now, when manipulating pictures, clear or invisible walls no longer block selection, dragging and rotation. Now when dragging selected framed pictures, only the ones that move are those on the same wall as the framed picture touched at the start of the drag. September 14, 2018: Version 3.5.2 adds copy and paste of framed pictures in a new meshing gears button on the screen left. Improves handling of 'canvas' and 'none' frame faces. Fixes a bug where Copy wall would not work if all walls in a scene were selected (even in scenes with just 1 wall). Fixes a bug where manipulating pictures state did not allow gesture drag and rotate movement of walls if no framed picture was in the scene. Improves performance and reduces relocalizing events. 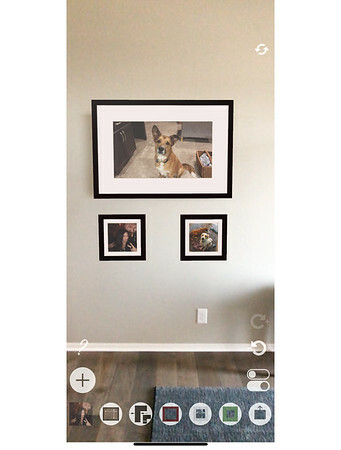 September 11, 2018: Version 3.5.2 adds lighting slider to adjust light on augmented framed pictures and walls. The lighting slider is shown or hidden from the Settings control panel. 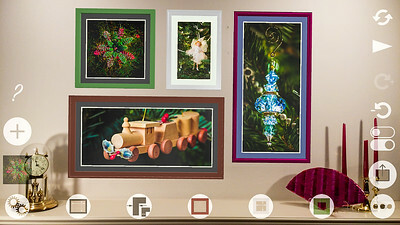 When multiple framed pictures are selected, all selected sizes are checked on the frame and mat window size menus. Fixes a rare bug where framed pictures would jump 0.66 m in front of their wall when frame thickness was missing. Sorts color menus in increasing 'L' using the Lab color rather than the HSL color. Adds a new 'Brighten buttons' setting. Speeds up changes in Settings and framed picture customizations. Disables menu items and buttons that depend on mat being visible. September 5, 2018: Version 3.5.1 fixes a rare crash caused when a exactly black color with rgb = (0,0,0) was selected with dynamic color picker. Adjusts light intensity for compatibility with iOS 12. Removes slight greenish color cast caused by environmental lighting map tint. August 24, 2018: Version 3.5.0 The pause button (||) now changes to a run button (|>) when tapped. Tapping the run button reruns the AR session and uses relocalization to restore the world coordinate system. By contrast the restart button reinitializes the AR session and removes all previous tracking information. Restarting requires a search for the floor. Use the restart button when the run button is ineffective. 3.5.0 also (1) requests permission to use location services to maintain scene orientation relative to true north; (2) displays a compass emblem pointing to true north on the floor patch when location services are available; (3) eliminates the required search for the floor-wall join when an existing scene is loaded. The floor-wall join search is now only required on initial app installation. Note: existing scenes are loaded relative to the initial camera position when the app was started and true north. Upon upgrading, you should expect to reposition scenes because of these changes. On load, scenes may be left, right or behind the initial camera orientation. July 5, 2018: Version 3.4.3 fixes the add frame (+) bug, changes frame material items "gold" and "silver" to "gold metal" and "silver metal" and corrects a problem where choosing "gold" or "silver" frame materials caused all other material colors to change their frame surface to metal. June 25, 2018: Version 3.4.2 adds performance improvements on most framed picture changes. The Delete item on the framed picture popup now deletes all selected framed pictures. Framed picture popup menu items now base suggested menu items and current status on the framed picture that initiated the popup. Finally, the release fixes a crash caused by the Cancel button in the custom color selection dialog when Cancel was pressed before any color was selected. June 18, 2018: Version 3.4.1 adds mat and overmat surfaces: burlap, canvas, rough and smooth. Frame surfaces added: metal, smooth, metal, oak, fine wood, gloss and rough wood. New frame profiles for fluted, reverse step and reeded frames. Drag and drop pictures directly from Photos and Lightroom onto a scene. Share jpegs from apps via the new share sheet extension. Based on the darkest, mid and lightest image colors, mat colors are now suggested with green highlighting. May 23, 2018: Version 3.2.0 adds enhanced frame styles and colors including textures and improved physically based rendering. Previous versions added multiple walls per scene and custom hue, saturation and brightness color pickers for walls, frames, mats and overmats that can sample colors directly from the scene.